The Ferrari 250 GT, Spider, Cabriolet, Series 1, is a rare vehicle with an exciting but sad history. The Ferrari, built in 1957 and with the chassis number 0799GT, was purchased in 1989 by the Swiss Dr. Andreas Gerber together with his partner Bernhard Friedli, who has passed away in the meantime. In 1993, the Ferrari 250 GT was stolen in the Spanish city of Marbella by members of the Italian Mafia and mysteriously transported to the USA. Dr. Andreas Gerber has undertaken everything to recover his stolen Ferrari, but has failed due to corruption in Spanish Courts. Several American citizens have illegally possessed and even resold the Ferrari since the theft of the vehicle in 1993, although the Ferrari 250 GT is being searched as stolen by Interpol, the Swiss police and other police authorities. Many rumors and untrue allegations are being spread in the Ferrari community about the Ferrari 250 GT. To counteract these fraudulent manipulations, the history of the vehicle has been set out extensively and accurately below. Every event related to the stolen Ferrari 0799GT is carefully documented by means of numerous sources and official documents so that you, dear visitor, can obtain a complete and objective picture of the history of Dr. Gerber’s Ferrari 250 GT. I hope you enjoy reading the exciting story of the Ferrari 0799GT. and 31 Kings Hill Road, Sharon, CT, 06069, USA. The 16th car of a total of 40 (36) units built. Construction of Ferrari 250 GT Cabriolet, VIN 0799GT. June 15, 1962 Sold by Musico to Antonio Antorina, Modena, Italy. Price paid was Italian Lire 3’000’000. 1968 Sold by Tom Meade to Lawrence Kitt Tucker, Jacksonville, FL, USA, mileage now 52’000 km. 1970 Registered on Texas license plates “NTF 852”, later on Texas license plates “365 VGV”. Sold by Peter Bowers for USD 680’000 to Michael W. Sheehan’s European Auto Sales Inc. Costa Mesa, CA, USA. April 3, 1989 Down payment of USD 50’000 paid by European Auto Sales to Peter Bowers. April 17, 1989 Finder’s fee of USD 10’000 paid by European Auto Sales to Lawrence Diaz. April 21, 1989 Ferrari 0799GT sold by Sheehan through broker W. Schoch Porsche Sales Inc., to the Swiss car dealer Andreas Zenari, Elite Diffusion, resident of CH-3284 Fräschels, Switzerland. Price paid was USD 780’000. April 27, 1989 Ferrari 0799GT sold by Andreas Zenari to Dr. Andreas Gerber, resident at Bassbeltweg 26 in CH-2542 Pieterlen, Switzerland, who coowned the car with his partner Bernhard Friedli-Mühlenen, resident at Frutigenstrasse 16 in CH-3601 Thun, Switzerland (Friedli died in 1996). Price paid was CHF 1’700’000. Dr. Gerber is the owner of Ferrari 0799GT to this day. Dr. Gerber and Mr. Friedli decided to sell Ferrari 250 GT Cabriolet VIN 0799GT together with three other Ferrari cars (VIN 1893GT, 365GT13811, 2925GT) which belong to Mr. Friedli. Mr. Friedli found prospective buyers in Marbella, Spain. The prospective buyers were the Italians Felice Cultera, Gianni Meninno and a Mr. G. Giudice (it later turned out, that these three Italians were all members of the Italian Mafia). In order to underline their interest and to convince Mr. Friedli and Dr. Gerber to transport the four cars to Marbella, Mr. Giudice presented a letter of credit in favour of Mr. Friedli to the Italian Consulate on July 18, 1991. The letter of credit had a stamp of the Italian Consulate on it. It was agreed to deposit the said document at the Italian Consulate in Malaga, Spain, in the name of Mr. Friedli. July 26, 1991 After the deposition of the mentioned letter of credit, Dr. Gerber and Mr. Friedli agreed and transported Ferrari 0799GT together with three Ferrari cars in the ownership of Mr. Friedli from Berne, Switzerland, to Marbella, Spain. In Marbella the cars were stored in a garage called Motorauto Marbella. This garage later turned out to be a bogus company under the control of the Italian Mafia. The garage was managed by Mr. Kelvin Fisher, a partner of the Mafioso Mr. G. Giudice. in fact not the real Consul but the secretary of the Mafioso Mr. Cultera, called Mr. Ugo Gianino who was only acting as Vice-Consul. Torrabadella, instructed Mr. Kevin Fisher by fax message on August 16, 1991 not to give the Ferrari cars to Mr. Giudice or to any other person. Since Mr. Kelvin Fisher was a partner of Mr. Giudice and the Mafia, it was already too late. The four Ferrari cars were in the hands of the Italian Mafia. 1991 – 1999 In order to obtain the cars as well as compensation Mr. Friedli and Dr. Gerber filed various lawsuits against Mr. Kelvin Fisher and his Mafia partners in Marbella, Spain. After the death of Mr. Friedli in 1996 the lawsuits were continued by the heirs of Mr. Friedli. operating in Marbella, which was behind the scam regarding the four Ferrari cars of Mr. Friedli and Dr. Gerber. Even the mayor of Marbella, Jesus Gil y Gil was corrupt and disqualified from holding public office for 28 years. For the duration of several lawsuits (civil procedures and criminal procedures) the four Ferrari cars were stored (and had to be stored by court order) in a warehouse of the garage Motorauto Marbella in Marbella Spain (as mentioned, a bogus company under the control of the Italian Mafia).The garage Motorauto Marbella was part of the criminal organization called “Ramirez Group Family Holding”. Dean Judge, Pilar Ramirez (presiding the Marbellan Court) belonged to the Ramirez Family and to the mentioned family holding. July 7, 1993 Ferrari 250 GT Cabriolet VIN 0799GT stolen, together with three Ferrari cars which belong to Mr. Bernhard Friedli, out of the warehouse of the bogus company Motorauto Marbella, in Marbella, Spain. After the theft of the cars, the garage Motorauto Marbella was shut down from one day to the next and its manager Mr. Kelvin Fisher disappeared. A second criminal complaint was lodged at the Police Commissariat of Marbella on July 21, 1993 by Mr. Bernhard Friedli und Dr. Andreas Gerber. As it later turned out, the stolen Ferrari cars were transported to Lisbon, Portugal, by truck and then shipped to the USA via Antwerp. December 1993 Onofrio “Frank” Triarsi of Classic Coach Ltd., Elisabeth, New Jersey 07202, USA “bought” the stolen Ferrari 0799GT together with the stolen Ferraris VIN 1893GT and VIN 2925GT from the thief (of the four cars) called Pedro Poiares from Lisbon, Portugal. Onofrio “Frank” Triarsi imported in total three of the four stolen Ferrari cars through C&K Auto Imports Inc., Leonia, NJ, 07605, USA. The stolen Ferrari cars were shipped and imported without any paperwork and without any titles. According to Mr. Michael Sheehan (Symbolic Motor Car Company, SMC, La Jolla, CA, USA) Mr. Onofrio “Frank” Triarsi did not want to know “certain aspects” of the history of stolen Ferrari 0799GT. Mr. Sheehan stated that the same is true for Mr. Hallingby’s friend, Mr. Nicholas Soprano (Motor Classic & Competition Corp., Bedford Hills, NY, 10507, USA). December 20, 1993 Doron Sauer, owner of C&K Auto Imports Inc. and importer of the stolen Ferraris became nervous because of possessing several Ferrari cars without proper paperwork. On December 20, 1993 he wrote a letter to the Leonia Police Department and informed Detective Grenner about the three suspicious Ferrari cars. This letter was later analysed by Sergeant Kline of the Western District Major Crime Squad. He came to the conclusion that Doron Sauer had “guilty knowledge” of the questionable background of the three Ferrari cars. 1994 Two of the four stolen Ferraris (namely Ferrari 250 GT Spider, Series 2, year of construction 1960, VIN 1893GT, red color with black leather interior and Ferrari 250 GT/e2 + 2, year of construction 1961, VIN 2925GT, black color, with cream leather interior) were titled to Onofrio “Frank” Triarsi (Classic Coach Ltd., Elisabeth, New Jersey 07202, USA) in 1994. Ferrari VIN 2925GT is still in the illegitimate possession of Onofrio “Frank” Triarsi to this day. Onofrio “Frank” Triarsi sold the other stolen Ferrari VIN 1893GT to Christopher James of One market Place, Steuart Tower, 22nd Floor, San Francisco, CA 94103, with Californian registration plate No. 4BHH636 for USD 150’000.00 on May 27,1997. The location of the fourth stolen Ferrari (Ferrari 365 GT 2 + 2, year of construction 1970, VIN 13811, blue color, with black leather interior) is not known. 1994 According to reputable Ferrari experts it has been known since approximately 1994 that Ferrari 0799GT was stolen. The theft of this car has also been mentioned on the website www.barchetta.cc for many years. March 20, 1995 Dr. Andreas Gerber filed a criminal complaint at the Cantonal Police of Berne, after realizing the inefficiency of and the corruption among the Police of Marbella, Spain. 1997 Stolen Ferrari 250 GT Cabriolet, VIN 0799GT, was sold by Scott Rosen to Jeffrey D. Schwartz, 110 Tekening Drive, Tenafly, NJ, 07670, USA. In 2000 or 2001, Onofrio “Frank” Triarsi contacted the importer of the stolen Ferraris, namely Doron Sauer (C&K Auto Imports), and asked the latter for a favor. Onofrio “Frank” Triarsi searched for the paperwork of the three stolen Ferraris (which did of course not exist due to the theft). Mr. Triarsi advised Mr. Sauer that the three vehicles were stolen and that Interpol was searching for the cars. 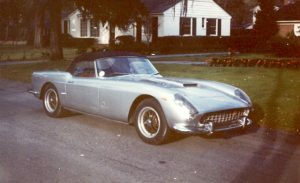 May 2000 Jeffrey D. Schwartz tried to sell the stolen Ferrari 250 GT Cabriolet, VIN 0799GT, to Symbolic Motor Car Classic Coach Ltd. Company (of Elliott Grossmann), La Jolla, CA, USA. Symbolic backed out of the deal when they found out about the theft of Ferrari 0799GT. Symbolic never bought the car. 2000 Jeffrey D. Schwartz returned the stolen Ferrari 250 GT Cabriolet, VIN 0799GT, to Frank Triarsi (Classic Coach Ltd.), explaining the legal problems and the theft to him. Frank Triarsi repurchased the car and sold it back to Scott Rosen. November 16, 2000 Scott Rosen offered USD 20’000.00 as compensation to Dr.
Andreas Gerber to relinquish his interest in the car. Dr. Andreas Gerber refused. Paul Barney Hallingby’s affidavit of October 29, 2009). It later turned out, that this alleged history check of the car was not true. In fact, FBI agent Ken Crook does not know Paul Barney Hallingby and Scott Rosen at all and was never hired by them as Mr. Crook confirms in an email to Attorney Oliver Weber (who is representing the victim Dr. Andreas Gerber) on March 10, 2010. 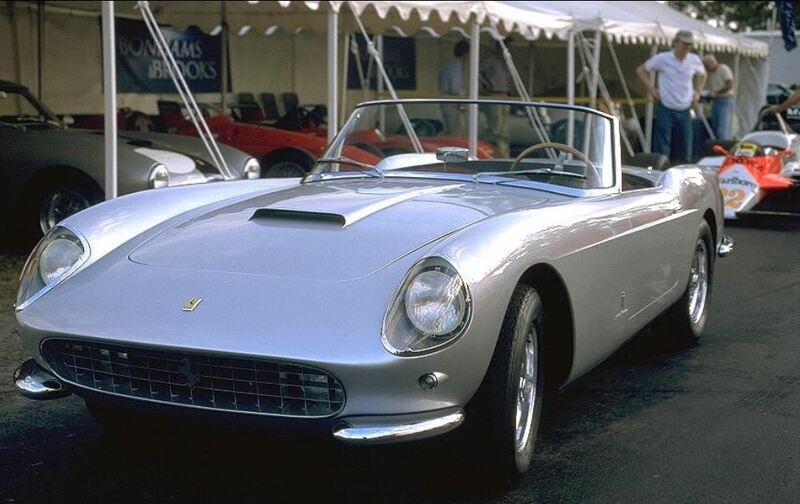 January 19-20, 2001 Ferrari Expert Marcel Massini observed the stolen Ferrari 250 GT Cabriolet, VIN 0799GT, during the Cavallino Classic X Concours at Moroso Raceway and Palm Beach, FL, USA. While Ferrari Expert Marcel Massini tried to take pictures of the car and of the tag with the serial number on the motor block, the mechanic of Mr. Paul “Barney” Hallingby immediately closed the hood and did not open it again. Mr.
Massini had never observed such strange behavior during a Car Concours before. 2008 The Swiss owner of the stolen Ferrari 0799GT, Dr. Andreas Gerber, published several advertisements in the “Ferrari Market” Letter and in the Cavallino Magazine in order to search for his stolen Ferrari car. 2008 After the stolen Ferrari 0799GT had been located at the domicile of Mr. Paul “Barney” Hallingby in Sharon, Connecticut, USA, the victim, Dr. Andreas Gerber filed a request to seize his stolen car at Connecticut State Police. 2008 After receiving the request for seizure, Connecticut State Police contacted Interpol about any entry of Ferrari 0799GT in the Interpol database. The search in the database of Interpol ended with a hit. Ferrari 0799GT is internationally searched for theft. 2008 The investigations of Connecticut State Police revealed that Mr. Paul „Barney“ Hallingby did not declare the location where he stored the stolen Ferrari 0799GT to his Insurance Condon & Skelly. Mr. Paul “Barney” Hallingby became nervous when his Insurance Condon & Skelly inquired about the whereabouts of stolen Ferrari 0799GT. 2008 The investigations of Connecticut State Police revealed that Mr. Paul „Barney“ Hallingby did not register the stolen Ferrari 0799GT until August 23, 2007. According to the police records Mr. Paul „Barney“ Hallingby never waited for seven years to register any of his other (more than 20) vehicles. 2008 Connecticut State Police found out, that Mr. Paul “Barney” Hallingby faked the vehicle identification number when he registered the stolen Ferrari 0799GT at the department of motor vehicles on August 23, 2007. The registration certificate shows that the VIN of the car was printed as “FER079958” instead of the correct VIN “0799GT”. Obviously Mr. Paul “Barney” Hallingby intended to hinder the identification of the stolen Ferrari 0799GT. 2008 The title research of Connecticut State Police revealed that Mr. Paul “Barney” Hallingby was in the possession of another stolen Ferrari. by a police flare (I’m from the government and I’m here to help you!). Mr. Paul “Barney” Hallingby wrote that some years later, Richard Freshman found “most of the salvageable parts and began the reconstruction”.This episode revealed Mr. Paul “Barney” Hallingby’s questionable behavior not only related to stolen Ferrari 0799GT. Mr. Paul “Barney” Hallingby’s Ferrari 250 LM was not real and he certainly knew about that. In fact, not even the chassis of Ferrari 250 LM was original. Mr. Paul “Barney” Hallingby sold his fake Ferrari 250 LM to DK Engineering (England) in 2011. 2008 Mr. John Barnes, Ferrari expert and publisher of the Cavallino Magazine and Gerald Roush the publisher of the Ferrari Market Letter confirmed that they considered Ferrari 0799GT a stolen vehicle. 2008 On September 4, 2008 Connecticut State Police requested the Superior Court of Connecticut to grant a warrant to seize the stolen Ferrari 0799GT. Judge Ginocchio of the Superior Court reviewed the Application and found Probable Cause. He issued the Search and Seizure Warrant on September 4, 2008. On the same day the stolen Ferrari 0799GT was seized by Connecticut State Police at the domicile of Mr. Paul “Barney” Hallingby in Sharon, CT, USA. “Based on the aforementioned facts and circumstances, and the Affiant’s training and experience, Probable Cause exists to believe that Paul “Barney” Hallingby DOB: 11-11-46 possessed the 1958 Ferrari bearing VIN 0799GT on September 4th, 2008 and that he knew the vehicle was stolen. The vehicle was located in his undocumented garage at his residence located at 32 Kings Hill Road in Sharon, CT. The Affiant respectfully requests the authority to arrest Paul “Barney” Hallingby DOB: 11-11-46 for the crime of Larceny I (C.G.S. 53a- 122)”. September 14, 2008 The State Attorney Mr. Shepack declined the prosecution of Mr. Paul “Barney” Hallingby. The State Attorney believed Probable Cause existed for the arrest of Mr. Paul “Barney” Hallingby but was not convinced that there was sufficient admissible evidence to prove Mr. Paul “Barney” Hallingby’s guilt beyond reasonable doubt at trial. March 10, 2009 Mr. Paul “Barney” Hallingby filed a civil action at the New York Southern District Court against the Cavallino magazine (John W. Barnes) and the Ferrari Market Letter (Roush Publications Inc.) for publishing the advertisements of the Swiss owner of the stolen Ferrari 0799GT. Mr. Paul “Barney” Hallingby wrongly alleged that the advertisements were false and defamatory because they described Ferrari 0799GT as a stolen vehicle. In December, 2011 Mr. Paul “Barney” Hallingby realized that he did not have any chance to convince a jury that Roush/Cavallino Magazine/Barnes were guilty of defamation. He offered the defendants to drop the lawsuit, which the latter accepted. The settlement of the parties was finalized in January 2012. The terms of the settlement were confidential. The purpose of this confidentiality was to mask Mr. Paul “Barney” Hallingby’s defeat. By Court Order of January 5, 2012 the New York Southern District Court dismissed Mr. Paul “Barney” Hallingby’s civil action. August 1, 2012 John W. Barnes (Cavallino magazine) published a public statement in his magazine, explaining why he and the Roush family did not give in to the lawsuit against Paul “Barney” Hallingby. John W. Barnes confirmed in his Commento that Ferrari 0799GT had a long history of being stolen and he explained why he believed the advertisements of the Swiss owner of Ferrari 0799GT to be correct. selling the stolen Ferrari 0799GT. The deal failed when the potential purchaser Mr. Constantin von Dziembowski learned about the theft of Ferrari 0799GT. 2014 Mr. Paul “Barney” Hallingby tried to sell stolen Ferrari 0799GT to another German, namely to Mr. Wolfgang G. Münster from Munich Classic Automobiles. This deal also failed due to the theft status of Ferrari 0799GT. 2014 – 2017 Mr. Paul “Barney” Hallingby offered the stolen Ferrari 0799GT to various auction houses. All of them refused to auction the car due to its theft status.